Quilling involves strips of paper that are rolled, shaped and glued to create decorative designs. The art form developed in the 16th century and spread during the Renaissance. 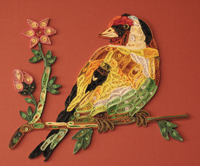 of quilling as an art form. Image: Image: John Yanni, Tropical bird (detail) 2010, paper. Courtesy of the artist.